Wellness and spa in South Tyrol has one name: Dolce Vita 'Wellness Around'. The 'Wellness Around' programme grants you access to the spa facilities of the Dolce Vita Hotels. As a guest at one of the Dolce Vita Hotels in South Tyrol you will find yourself in a true spa paradise. At no holiday residence will you find a wider range of beauty and spa opportunities than at the popular Dolce Vita Spa Hotels. Surrounded by a breathtaking natural landscape of the Vinschgau Valley and the Merano region you will enjoy the Mediterranean climate and cordial hospitality at Dolce Vita Hotels during your holidays in Italy. This is wellness and spa in South Tyrol. At the South Tyrolean Dolce Vita Hotels - independently run holiday hotels for demanding guests - you experience wellness and spa times. A guest at one Dolce Vita Hotel has free access to the wellness & spa facilities at all Dolce Vita Hotels. Wellness and spa: extensive wellness & spa areas - every single one an individual spa jewel making your holiday richer. All together the Dolce Vita wellness & spa facilities are a holiday proposal you can hardly argue with. Why not enjoy spa fun in South Tyrol all times? 'La Dolce Vita' means 'the sweet life'. And that is how it should be. Holidays indulging in wellness and spa at a Dolce Vita Hotel are balm for body and soul. 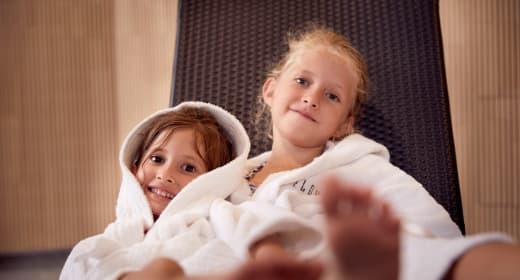 Be it at the Dolce Vita Activity Resort Hotel Jagdhof, Feldhof DolceVita Resort, the lifestyle hotel Lindenhof or at Hotel Preidlhof - find out the true meaning of wellness & spa at the Dolce Vita Hotels in South Tyrol. A further advantage: all Dolce Vita Hotels lie within a radius of 30 kilometres. Have you decided on your favourite Dolce Vita Hotel to enjoy wellness and spa in South Tyrol? Book your room at your preferred hotel today. The Dolce Vita team is looking forward to your non-committal enquiry.